Adapted from a recipe that I can no longer find (The Guardian, I think). Why did I plant sixteen tomato plants? My kitchen counters are awash in tomatoes. So, I’m cooking with them as much as possible. By dinner time last night, I had enough Weight Watchers points to use a bit of bacon and an ounce of parmesan with pasta. 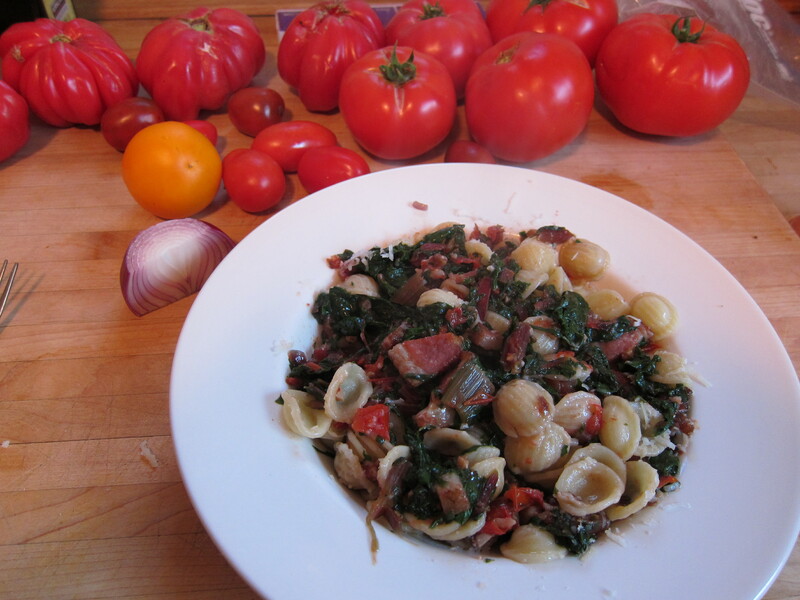 Swiss chard (from my garden), tomatoes (ditto), and red onion laid over a base of garlic and smoked bacon made for a hunger-diminishing plate of pasta. This is a pasta dish where there is definitely more sauce (mainly vegetables) than there is pasta. But you won’t care. Prepare all the ingredients before you proceed. Put pasta bowls in warm oven. Put a pot of water on to boil for both the chard and the pasta. While it is coming to a boil, heat the olive oil and add the bacon pieces. Fry until not quite crisp. Reduce heat and add garlic and red onion. Stir to prevent the garlic from turning deep gold. When the water is boiling, add the Swiss chard leaves to the water. Depending on how fresh or thick they are, blanch the leaves anywhere from 30 seconds to two minutes. Drain, let cool, while you continue to stir the garlic to prevent from burning. After a few minutes, add the chopped tomatoes. Bring the water that you’ve blanched the chard in to a boil again and add the pasta, which should take 11 minutes or so, which will give you time to continue. While the tomatoes cook down, use your hands to gather the blanched chard into a ball and squeeze as much water out of it as possible. Roughly chop the chard and add to the bacon, tomatoes, garlic, and onion. Season with salt and pepper. Stir to incorporate. The tomatoes should give off liquid. Adjust heat to prevent the liquid from evaporating completely. Drain the pasta, shake excess water off, and toss into the skillet with the sauce. Stir and taste for seasoning. Transfer to heated pasta bowls. Grate fresh parmesan over the plates and serve.